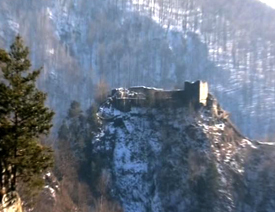 On a high inaccessible mountain top on the border of Transylvania stands Castle Poenari (pictured right). This is the real Castle Dracula which even today can be found in a very remote and highly forbidding place reached by 1480 steps which wind their way up the mountain to the castle. 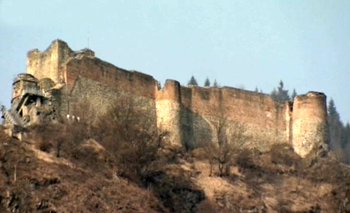 Construction of Castle Poenari began around a watchtower which had been originally built by Vlad's grandfather and Vlad would use slave labour to speed up the construction of this imposing sanctuary. Wallachian chronicles report that the men and women who were forced to work on this Castle worked so hard but their clothes literally fell off them leaving them to work quite naked. The castle was built using the Byzantine style of building 2 brick walls in filled with rubble making them up to 9 feet thick. Because this Castle was built in what is actually an earthquake area, the castle was built using lime mortar which would be more flexible and even allow the walls to move in the event of an earthquake. Although there have been many earthquakes in this area over the years, many of Castle Dracula's walls still stand intact today. This impressive castle was clearly not built only using slave labour but must have had expert craftsmen overseeing the work. Evidence of this can be found in the fact that the roofs of this castle collect rainwater and cleverly feed it into a system. The river valley below would have contained everything needed to build Castle Dracula including sand for mortar, gravel and small rocks for the filler for the Byzantine walls and even substantial rocks for the castle base. The red bricks would almost certainly have been fired locally. When finished, the castle was approximately 32 feet wide by 180 feet long and it would have covered virtually the whole summit of the mountain. This towering castle construction would have been quite secure and offered control of a strategic pass through the mountains. It was also an ideal location for Vlad to plan how he would deal with the Transylvanian Saxons who he knew were plotting against him for their own ends.